The Agence Française de l' Enseignement à l'Étranger who validated it and gave us money for the digital camera to be used during the trip. Banco Safra and Carrefour who have donated money to reduce the cost of the trip for our grant holders. Monsieur Dubrule who very kindly offered to print our raffle tickets so that we wouldn't have to spend anything on that. 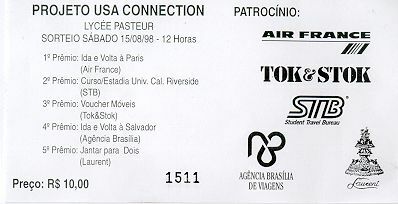 Air France , STB, Tok Stok, Agencia Brasilia and Laurent who have contributed with very generous prizes for our raffle ticket so that we could raise money to be spent on the trip.